This contemporary text addresses a wide range of diverse groups in society as they relate to the criminal justice system. 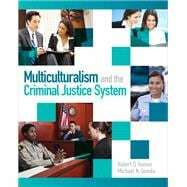 Multiculturalism and the Criminal Justice System, 1e, is the contemporary text that addresses diversity and multicultural issues in the policing, judicial, correctional, and juvenile justice segments of the criminal justice system. This text contains numerous visual aids that showcase data that is current and relevant. Unlike the competition, this text is comprehensive in its portrayal of various minority groups, addresses the issues from a systemic view of criminal justice, is practitioner-driven, and is well organized.